There are undeniably almost countless of online dental and surgical magnifying loupes and headlights retailers in the world today. Some offer high-quality products at a very hefty price while others sell more affordable magnification loupes and headlights but with a "not so good" quality. Schultz Dental Loupes does not fall under either of these two categories. We always make sure that we create our own path in this industry. We offer you only the best loupes and headlights both in terms of quality and affordability. In terms of quality, reliability, and price, you can consider us as the best. We offer high-quality dental loupes and dental headlights at a very affordable price. Through the years, we have successfully established our own reputation, making us one of the most trusted brands in the world. In fact, we have been featured on the popular TV Series known as "Bones" and we have been supplying countless of loupes and headlight products to all types of users ranging from large institutions such as UCLA and MERCK to private individual clinics and even to students. We have our own factory and laboratory. Schultz has been manufacturing superior quality dental headlights and loupes for more than a decade already. Over the years, we have been able to hone our manufacturing expertise, allowing us to get better and to create new innovations. Our latest innovation is the Fusion TTL Loupes which offer a perfect combination of the flexibility of flip ups (in terms of adjustable PD) and the light weight of TTL. A lot of clients ask us why we are able to offer dental magnification loupes and headlights at prices that are almost the same as those cheap yet subpar magnification and illumination products. A quick answer to this question is that we have our own factory and we manufacture our own products. Loupe Direct is our new factory direct sales approach. Our dental optical loupes and dental LED headlights are offered at the lowest price in the industry. Because we make our own products and we don't need to pay for middlemen or for agents' fee, we are able to provide you with factory-priced superior quality products. We are always providing sale! We are overwhelmed with how all types of users trust and pick us. That is why we offer discounts on a regular basis as a way of thanking our avid clients. 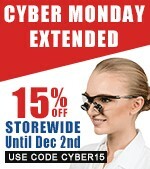 This week we are offering 15% off for our Cyber Monday Storewide Sale. You can avail of this special discount until December 2, 2017. Just use the promo code CYBER15 when making the purchase and you are good to go. This entry was posted in Dental industry news | Schultz Dental surgical blogBy Roger Jing On Dec 01, 2017 .